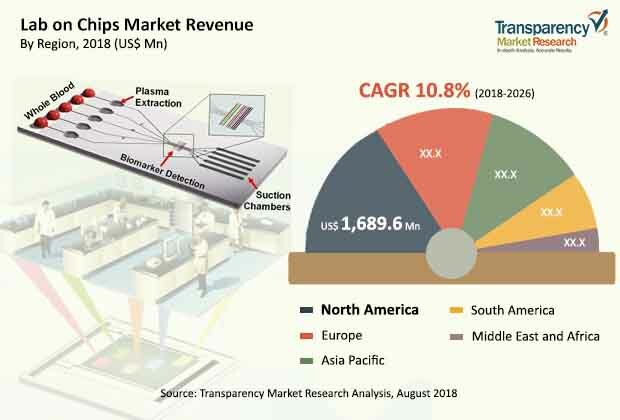 The global lab on chips market was valued at US$ 4,505.6 Mn in 2017 and is anticipated to register a stable CAGR of 10.8% during the forecast period 2018 to 2026, according to a new report published by Transparency Market Research (TMR) titled “Lab on Chips Market– Global Industry Analysis, Size, Share, Growth, Trends, and Forecast, 2018–2026.” Multiple advantages of microfluidic technologies, rise in demand for diagnostics, ballooning global population offering significant growth opportunities, and technological advancements in laboratories has increased the penetration and growth of the lab on chips market globally. The market in North America is expanding at a significant CAGR of 10.3% on the backdrop of numerous technological innovations in advanced laboratory equipment. The growing demand for diagnostics with high speed, efficiency, and sensitivity of results has increased the demand for atomic force microscopes globally. The need for diagnostics is increasing in order to monitor and detect various infectious diseases and blood-related disorders. Numerous players from North America are continuously involved in acquisitions in order to offer technologically advanced microfluidic technologies for accurate and early detection of a disease or condition. In March 2018, Danaher Corporation acquired Integrated DNA Technologies (IDT), a provider of high-value consumables for genomics applications in molecular biology, in order to expand its product portfolio. Key trends prevalent in the lab on chips market are micro-channels in chips, increasing use of microfluidics in life science industry, focus on research and development, increase in the usage of POC and IVD, and increasing investment in the healthcare industry. The application segment of the market is divided into genomics & proteomics, diagnostics, drug discovery, and others. Diagnostics segment is anticipated to dominate the market due to growing adoption of lab on chips for diagnosis of various chronic diseases. Rise in the overall global population ultimately increases the number of patients with diseases and subsequent demand for microfluidic systems for diagnosis, treatment, and monitoring of these diseases. Furthermore, rise in personalized medicine, drug discovery and life science research, need for high speed diagnostics, and increased government funding are some of the key factors driving the global lab-on-chips application market. These factors are expected to boost the growth of the lab on chips market. Diagnostics segment is anticipated to expand at the highest CAGR of 10.7% during the forecast period 2018 to 2026. Genomics & proteomics segment is projected to expand at a significant CAGR over the forecast period owing to the increasing use of lab on chips for ultra-high-resolution studies of proteins and DNA. Geographically, the global lab on chips market is divided into five major geographical regions. These include North America, Europe, Asia Pacific, South America, and Middle East & Africa. In 2017, North America was the topmost revenue generating region followed by Asia Pacific. This is mainly attributed to research and advancement in technology and wide acceptance of lab on chip technology in the field of research and by pharmaceutical companies for the drug discovery process and for diagnosis tests. The U.S. held the highest market share in 2017 in North America and is estimated to expand at a considerable CAGR during the forecast period. The market in Europe is anticipated to grow at a significant CAGR during the forecast period owing to the continuous growth in biological and chemical industries. The lab on chips market in Asia Pacific is expected to expand at the highest CAGR of 13.2% over the forecast period. Factors such as growing technological innovations and popularity of conventional biological laboratories, presence of large number of hospitals, and increasing R&D investment are expected to drive the Asia Pacific lab on chips market. Middle East & Africa and South America are expected to expand at a substantial pace due to the large pool of patients and rising government funding in the regions. The company profiling of key players in the global lab on chips market includes company overview, major business strategies adopted, SWOT analysis, and market revenues for years 2016 to 2018. The key players profiled in the global lab on chips market report includes Becton, Dickinson and Company, Agilent Technologies, Inc., PerkinElmer, Inc., Danaher Corporation, Bio-Rad Laboratories, Thermo Fisher Scientific, F. Hoffmann-La Roche AG, Abbott Laboratories, IDEX Corporation, RainDance Technologies, Inc. and Fluidigm Corporation. Various players are introducing technologically advanced lab on chips and establishing partnerships with other players to meet the continuously growing demand for microfluidic systems for diagnosis, treatment, and monitoring of diseases.